No name is more tied with the Civil Rights Movement than perhaps that of American baptist minister and activist, Dr. Martin Luther King Jr. He advanced civil rights greatly with his commitment to nonviolent civil disobedience as a means to draw attention to the many forms of oppression black people were facing at the time. More than that, MLK Jr. was known for his compelling language in beautifully moving speeches that led a revolution. Nonviolence is directed against forces of evil rather than against people who happen to be doing the evil. It is evil that the nonviolent resister seeks to defeat, not the persons victimized by evil. Stride Toward Freedom is Dr. Martin Luther King, Jr.’s account of the first successful large-scale application of nonviolence resistance in America is comprehensive, revelatory, and intimate. His words inspire black activists to this day. 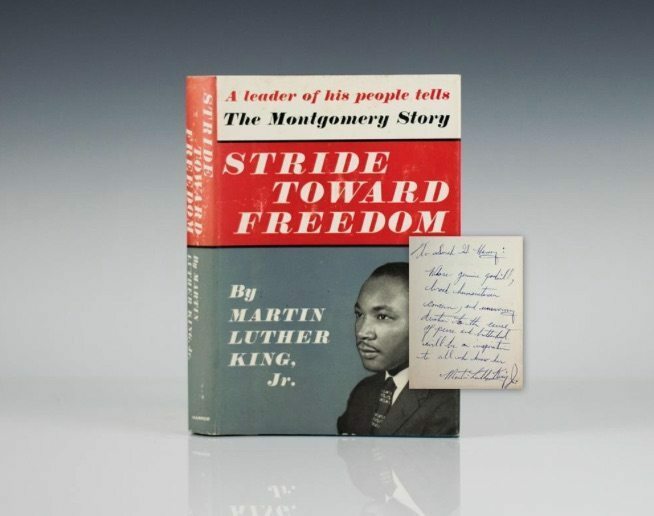 Stride Toward Freedom is available in its first edition with a lengthy inscription by MLK Jr. himself. Ten years later, after the Civil Rights Act of 1964 and the Voting Rights Act of 1965, wrote his analysis on the country’s race relations and their future in Where Do We Go From Here: Chaos or Community? With powerful eloquence, he discusses what he considers the end of phase one of development in the civil rights revolution with Selma and the Voting Rights Act. Power at its best is love implementing the demands of justice. Justice at its best is love correcting everything that stands against love. Where Do We Go From Here and Stride Toward Freedom are both lengthily inscribed by Dr. Martin Luther King Jr. with words of gratitude and support for the movement. Barack Obama is the first black president of the United States, but he was also an influential leader of civil rights and education before he campaigned to be president. He began his career as a civil rights attorney, attending a fellowship at University of Chicago Law School for two years while he wrote his first book, Dreams from My Father: A Story of Race and Inheritance. The book begins with the death of Obama’s father, a man he knew more as a myth than a figure, and the journey that leads Obama to reconcile his both black and white ancestry. Barack Obama wrote Dreams from My Father without much experience as a writer, and yet earned outstanding reviews. We have two first editions available, both signed by the author. He would go on to write his second book, The Audacity of Hope: Thoughts on Reclaiming the American Dream, shortly before his 2008 presidential campaign. The phrase, “the audacity of hope,” was derived from a sermon from his former pastor that talked about having the “audacity to hope” when someone has so little left to hope for. In his book, Obama gives an autobiographical summary of his core values as a senator, the state of the United States, and what steps he thinks the country could take to reclaim the American dream. 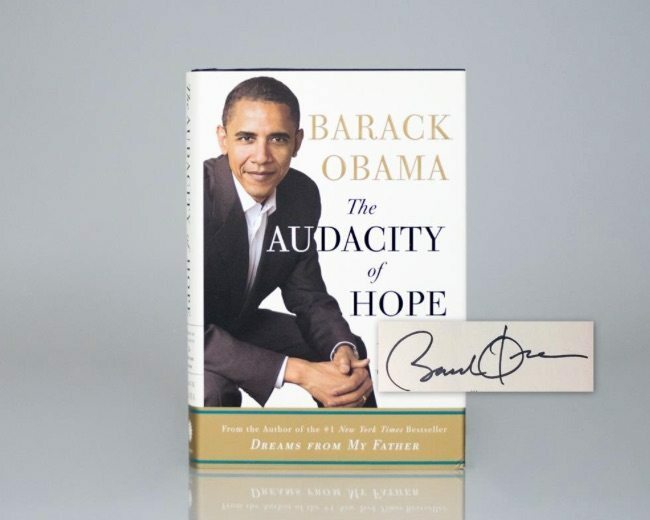 The first edition of The Audacity of Hope is available though us, signed not just in Barack Obama‘s initials, but with his full name. 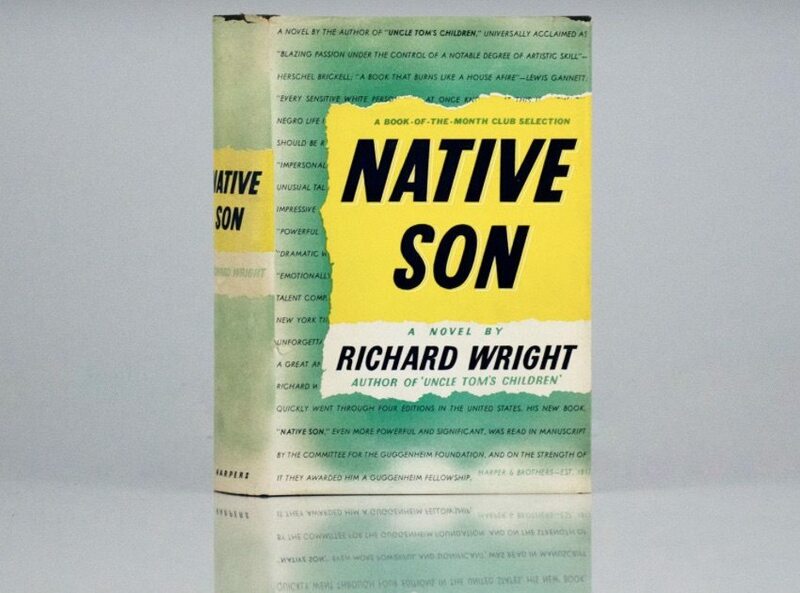 Richard Wright’s ground-breaking novel Native Son tells the story of 20-year-old Bigger Thomas, an African American living in utter poverty in Chicago’s South Side ghetto in the 1930s. Rather than apologizing for Bigger’s crimes, Wright brings to like the systemic oppression that made them inevitable. Native Son still holds enormous relevance in today’s culture and remains a valuable reference for black activists. 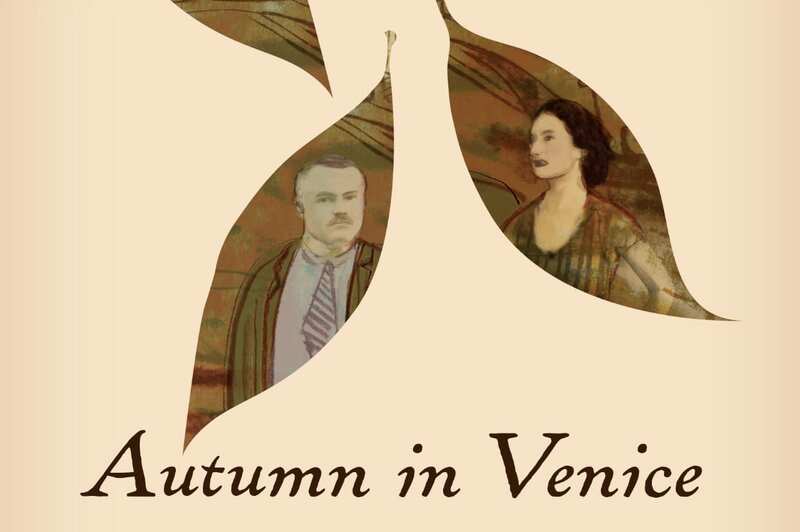 Find it with us in its first edition, signed and dated by the author. Before becoming an author and poet, Maya Angelou lived out a full career as an actor, producer, and director of plays, movies, and public television shows. But when Maya Angelou did earn a name for herself as a writer, she did so right away with her critically-acclaimed first book, I Know Why the Cage Bird Sings. The book named Angelou as a new kind of memoirist, one of the first African American woman to speak openly about her personal life. 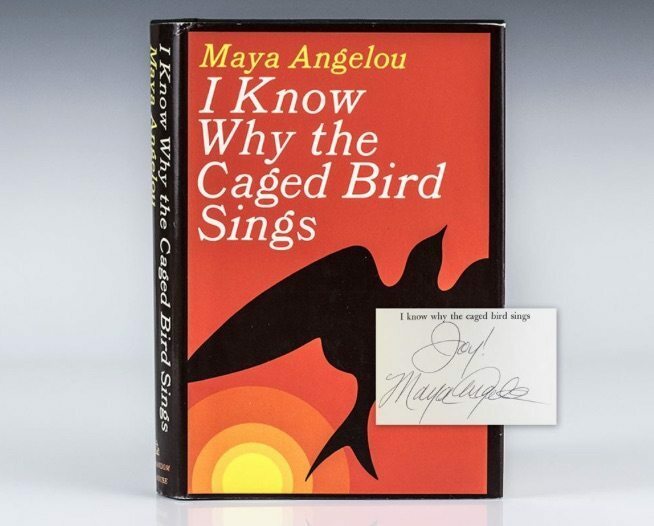 In addition to I Know Why the Caged Bird Sings, you can find Maya Angelou’s first editions works: Letter to My Daughter signed, Amazing Peace signed, Even the Stars Look Lonesome signed, A Song Flung Up to Heaven signed, and more available with us. Everything I’ve ever done, in the writing world, has been to expand articulation, rather than to close it, to open doors, sometimes, not even closing the book – leaving the endings open for reinterpretation, revisitation, a little ambiguity. 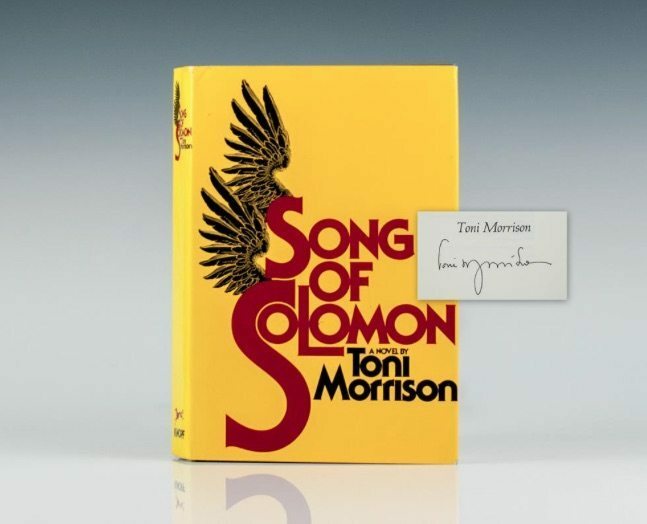 Toni Morrison’s writing focused primarily around the experiences of African American girls and women. Her first novel The Bluest Eye, which she wrote while she had two children and was teaching at Howard, is about a young black girl who longs to have blue eyes. Her novel The Song of Soloman was chosen for Book Club of the Month, the first novel by a black novelist since Richard Wright’s Native Son. Men and women, politicians and pastors – African American history has been shaped by the hands of so many individuals from every walk of life. What better way to celebrate their contributions than by reading their words, life stories, and dreams.